The last few years have seen the reemergence of several movie serials — both silent and sound — thought to have been lost forever. 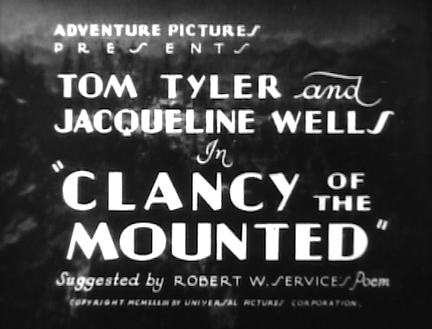 The latest, now available from our friends at Hermitage Hill Media, is a 1933 Universal cliffhanger titled Clancy of the Mounted. It’s the third of the studio’s four chapter plays featuring silent-screen cowboy Tom Tyler, who is probably best remembered by serial fans for his starring turns in Adventures of Captain Marvel (1941) and The Phantom (1943). Hermitage Hill recently obtained the first six of Clancy‘s 12 episodes, and until the others turn up (if indeed they ever do), I’ll happily settle for these. Like all Universal sound serials made up to the fall of 1936, Clancy of the Mounted was produced by Henry MacRae, the affable Canadian filmmaker who was one of the earliest employees of Carl Laemmle’s Universal Film Manufacturing Company, which incorporated in 1912. Although he held many management positions during his thirty-odd years at Universal City, MacRae never stayed away from serials for long. With the exception of director Spencer Bennet, no other person was involved in the production of more chapter plays. While the Clancy brothers take turns admiring the new arrival, trapper Dave Moran (William Desmond) rides up and breathlessly informs Tom that prospector John Laurie has just been found murdered — stabbed to death — with Steve’s knife buried in his chest. The younger Clancy denies any knowledge of the crime but Tom is forced to place him under arrest. In short order we learn that Laurie’s killing has actually been committed by Pierre La Rue (Leon Duval), henchman of “Black” MacDougal (W. L. Thorne), who runs a trading post in the village of Old Fort. MacDougal, who owns a mortgage on Laurie’s property, has learned that the old prospector located extensive deposits of silver and radium on his land. The trader expects to seize control of the claim but is stymied by the unexpected arrival of Laurie’s daughter Ann (Jacqueline Wells), whom the old prospector had summoned by mail before meeting his untimely end. The goodies: Tom Tyler and Jacqueline Wells. Realizing that the girl must be eliminated at once, MacDougal orders La Rue and some flunkies to wipe her out. Steve Clancy, having been released on his own recognizance, fears that he’ll be convicted on circumstantial evidence and decides to run away until his innocence can be established. He encounters Ann and saves the girl’s life when La Rue and his men attempt to kill her. Subsequently, Tom recaptures Steve and persuades him to stay in jail while the Mountie investigates Laurie’s murder. Ann refuses to believe her erstwhile rescuer capable of such an heinous crime and agrees to help the Sergeant clear his brother’s name. The baddies: W. L. Thorne and Leon Duval. That’s about the size of it. The scenario by Ella O’Neill, Basil Dickey and Harry Hoyt is straightforward and Ray Taylor’s direction gets the salient plot points across without embellishment. The first six chapters won’t be surprising to those viewers familiar with Universal serials of the early Thirties, but they are fast-paced and entertaining. Tyler acquits himself handily and cuts a dashing figure in his Mountie uniform. Jacqueline Wells, one of the loveliest serial heroines of the early talkie years, delivers a capable performance and — rather surprisingly — participates in several potentially dangerous action sequences. She’s photographed in a canoe shooting down river in foaming rapids and in a speeding buckboard careening wildly along dirt roads. My favorite chapter ending is one I can’t remember having seen in any other serial. Tom and Ann are heading back to Old Fort with a captured heavy when a violent storm suddenly breaks. 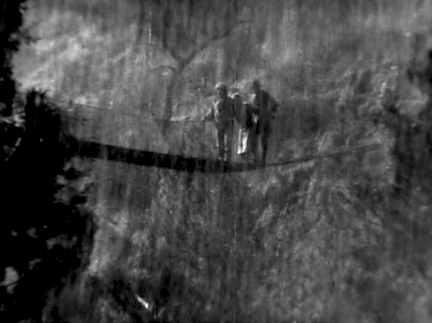 They are proceeding along a flimsy rope bridge when it is struck by lightning, precipitating all three into the churning river below. Lightning is about to strike this bridge, plunging all three into the river below. MacRae was nothing if not loyal to the veteran actors who toiled in chapter plays of the silent era. He gives good parts to Universal serial and Western regulars such as Francis Ford, William Desmond, Tom London, Edmund Cobb, Fred Humes, Monte Montague, and Artie Ortego. Pathé’s top serial villain of the Twenties, Frank Lackteen, turns up in Chapter Six as a renegade Indian. At this time Universal spent an average of $150,000 on its 12-chapter serials. Some were brought in for less, and I suspect Clancy of the Mounted was one of them. 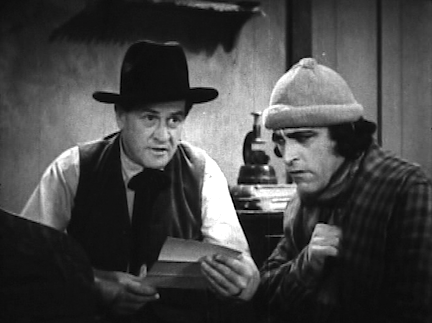 Unlike most Mountie pictures, which were filmed on location at Big Bear Lake or Lake Arrowhead, in the densely wooded mountains of San Bernardino County east of Hollywood, Clancy appears to have been shot largely in the hills behind Universal’s back lot and in the forest surrounding Lake Sherwood in Ventura County — less than an hour’s drive from the studio. This meant that the actors went home every night, saving MacRae the expense of food and lodging attendant to location jaunts. It would be nice if all the newly resurrected serials turned out to be classics. But that’s more than we have any right to expect. 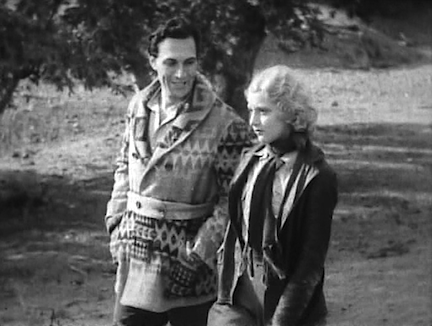 I’m perfectly satisfied with Clancy of the Mounted because I like the people in it, and I like Universal chapter plays of the early talkie years. Hermitage Hill has done a fine job of mastering a slightly worn but sharp print with nice tonal range. At a mere $12.95 plus postage, this DVD is well worth the price. Richard, just click on the Hermitage Hill link in the third line of this post. That will take you directly to their site, where you’ll find the necessary info. Thanks, Ed! Fascinating stuff. Love your writing about serials. I am grateful for all of you folks who have provided impetus for finding these “lost” serials. I loved Daredevils of the West and Brenda Starr! I really enjoyed the first six chapters, ordered it as soon as it was available. And what a beautiful print. Let’s hope the last six chapters turn up some day. Preferably while we are still alive. Can you tell me how to buy the DVD CLANCY OF THE MOUNTED? I can’t find the website. Does it still exist? Sorry, but this seller is out of the business. I don’t know who, if anybody, got his video masters.